What is a good relationship without the ability to make fun of each other and enjoy some humor? All good, long relationships are built on some kind of positivity and friendship at its very core, which is what truly allows said relationship to withstand the test of time. This is especially so with romantic relationships that result in marriage. It isn’t very easy to live with someone in close proximity if you can’t unwind and relax! 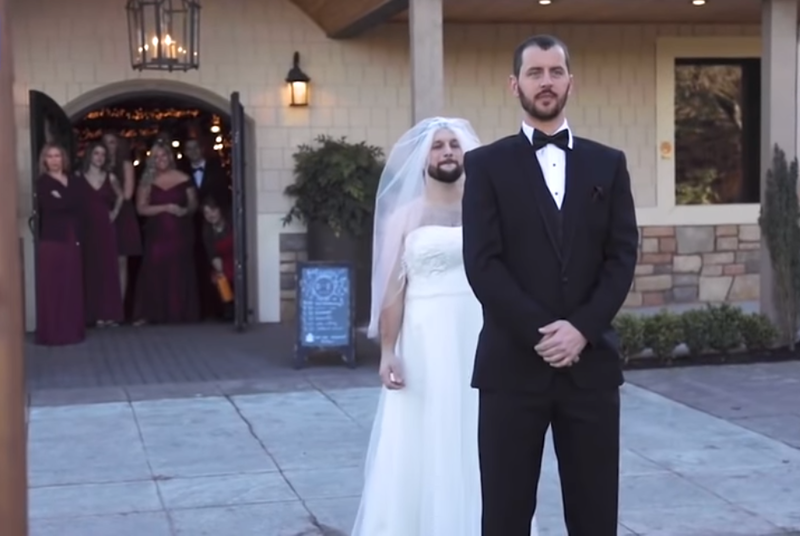 David and Brianne Hofmann’s wedding in Snohomish, Washington was expected to be a very serious, no-nonsense event. This was something that Brianne had been very insistent on, and it is an understandable sentiment. After all, this was an important milestone event in one’s life, and one that everyone will be looking back on later in life. So when she was approached by Timmy Horton – the groom’s best man – to do pull a wedding prank, she wasn’t entirely sure about the whole idea. What had happened was that Timmy had seen multitudes of viral videos featuring wedding day pranks, and was inspired to pull off one of his own at his best friend’s wedding. Luckily for Timmy, Brianne eventually agreed to the harmless prank. The idea relied on one crucial detail – at every wedding, there would be the long-held tradition where the bride would walk up to the groom, while the latter had his back turned. 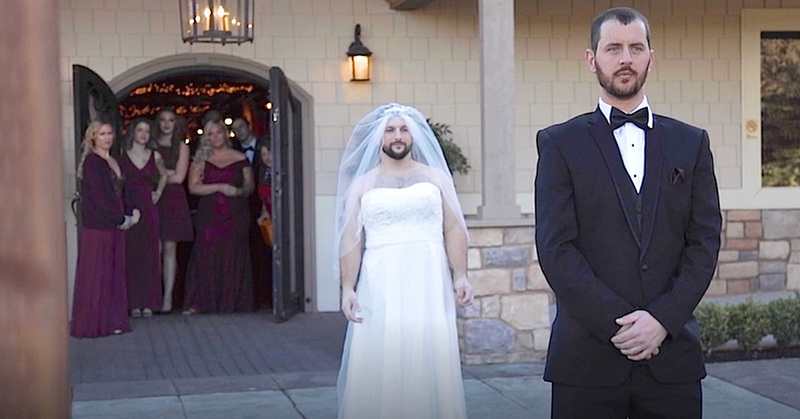 This the first look – in other words, this is normally the moment where the groom saw the bride in all of her wedding splendour for the first time. With the bride on board, Timmy then roped in the help of the wedding photographer, Anna Morrison for his ingenious prank. The idea was as thus – Timmy would borrow Anna’s old wedding dress and fit into it. Then, he would take Brianne’s place to walk up to the nervous groom and him a great surprise! These were the only people that were aware of Timmy’s prank. So when the wedding began, Timmy joined the everyone into the ladies’ dressing room to squeeze into Anna’s old wedding dress. 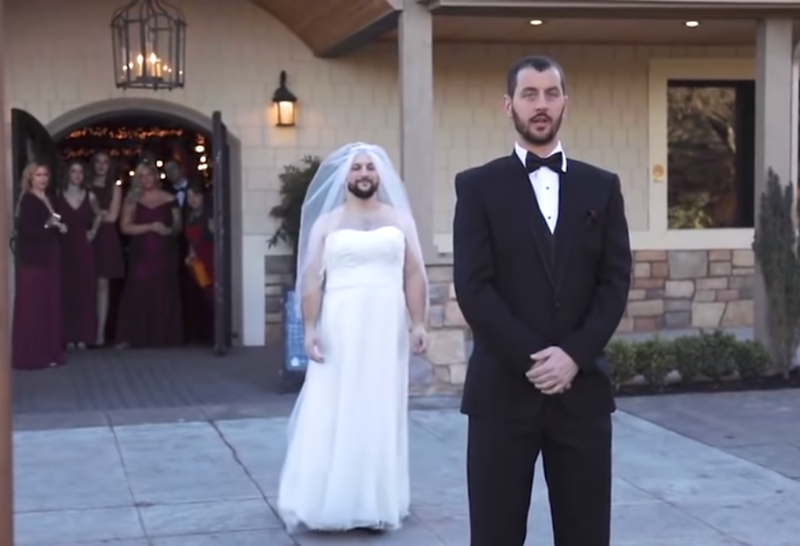 This was much to the displeasure of the other groomsmen, who weren’t in on the joke and were confused as to where Timmy had gone – until they saw him walk out in a wedding dress. To everyone’s surprise, the dress actually fit Timmy perfectly! And to seal the look, they even topped him off with a long, flowing veil made of chiffon. He was ready. 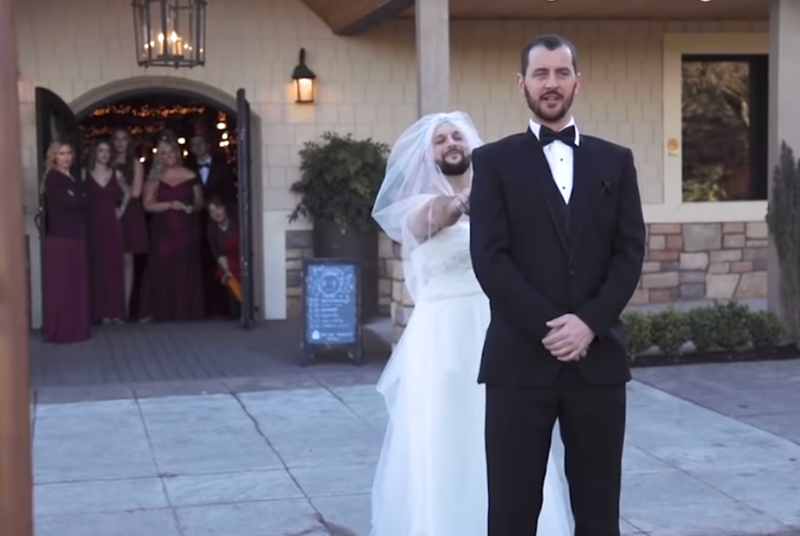 In a video captured by the wedding photographer, Anna, you can see Timmy walking quietly up to David in all of his mustachioed glory, unable to keep a massive smile off his face. When David turned around to see Timmy, he too ended up laughing alongside his best man! This is certainly a moment that will be recalled with great fondness and joy as the years pass. At the very least it is definitely a story for all who were involved to share with their children in the future!